Guante: YOU BETTER WEAPONIZE pre-sale through Strange Famous Records, first single, release details! YOU BETTER WEAPONIZE pre-sale through Strange Famous Records, first single, release details! 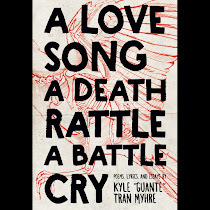 Check out the first track on the new Guante & Big Cats album, YOU BETTER WEAPONIZE. The song is called "To Young Leaders." You can now PRE-ORDER the new album exclusively through our friends at STRANGE FAMOUS RECORDS (home to Sage Francis, B.Dolan, 2mex, more). We're very grateful for the support, and this is a pretty cool deal too, especially if you live somewhere else and can't pick up a CD in-person from us. Click this link for details on the standard signed CD or the bonus materials package. 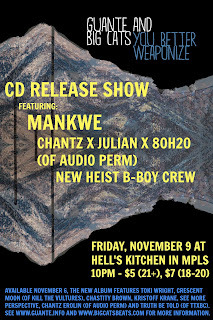 If you're in the Twin Cities, be sure to mark your calendar for our RELEASE PARTY on Friday, November 9 at Hell's Kitchen in MPLS. Here's the Facebook event page. 1. The lineup is unique and beautiful. Mankwe is a brilliant singer/songwriter whom you should all know about. 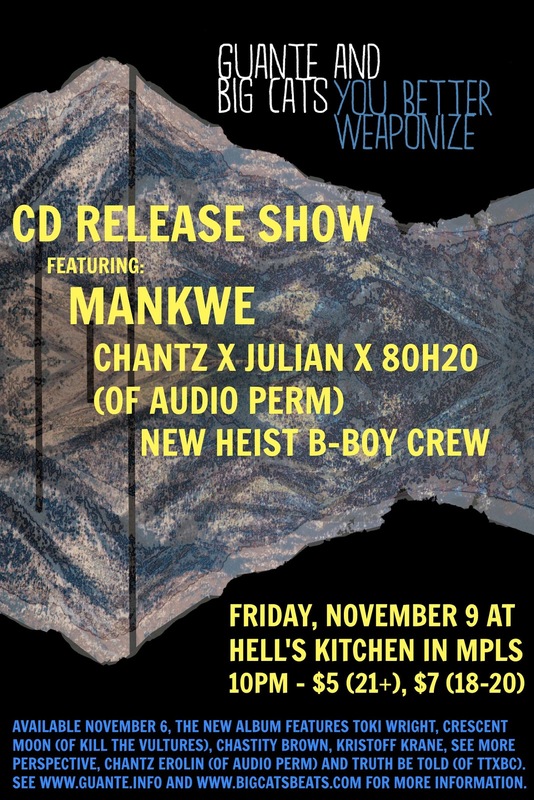 Chantz is probably the most talented local rapper you don't know yet (I mean, unless you do), and he'll be joined by Julian Fairbanks and 80H20 to represent Audio Perm. And we'll also have the New Heist crew in the building to make sure the b-boy element is represented. Plus us, all for just $5 if you're 21+ or $7 if you're 18-20. That's a steal, so arrive early. 2. Hell's Kitchen is one of the best places in town to see a show. The food is great, the staff is friendly, the sound is superb, and they're pretty damn progressive too. It's right downtown, so you can take the bus or park in the $5 ramp that is RIGHT next door. 3. This is your official post-election after-party. No matter who wins, there's going to be work to do. Let's recharge. Our album is dropping online on Election Day to push that message even more-- voting matters, but what we do the day after and every day is what matters the most. 4. Our last release party at the Bedlam Theater was one of the best shows I've been a part of, and Big Cats' solo release party last week at the Cedar was even bigger and better. Our crew, our community, our family-- it's going to be beautiful. 5. This is the best art I've ever made. As a lyricist, as a vocalist, as a poet, as a writer, as a performance artist, whatever-- this is leaps and bounds beyond what I've done so far. I can't speak for Big Cats, but I think this is some of his very best work too. The album also features Toki Wright, Chastity Brown, Kristoff Krane, Crescent Moon (of Kill the Vultures), See More Perspective, Chantz Erolin (of Audio Perm) and Chris Hooks (of TTxBC). It's wild. If you already support us, you're going to be validated in a big way, and if you've never heard of us, you're not going to see this coming. Can't wait to share it with you. Here's the cover and tracklist. Finally, as always, please SHARE this page. We're doing this DIY (with the SFR assist) and rely on word-of-mouth, Facebook posts, Tumblr posts, Tweets and all that. THANK YOU! free shipping on the preorder would be killer!